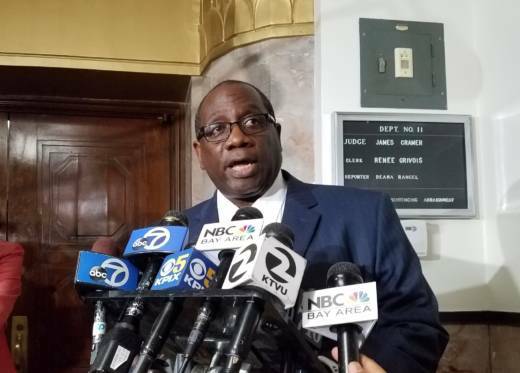 Alameda County's district attorney has told a judge she will no longer consider plea deals for two men charged in a 2016 warehouse fire that killed 36 people attending an unlicensed concert, according to a document obtained by The Associated Press on Thursday. In a letter to the judge presiding over the case, District Attorney Nancy O'Malley also asked for a trial date to be set soon on the 36 counts of involuntary manslaughter each man faces. The two are scheduled to appear in court on Friday for the first time since Judge James Cramer rejected a plea deal negotiated by O'Malley's office and lawyers for Derick Almena and Max Harris. O'Malley told the judge she changed her position on plea negotiations after grieving families of the fire victims testified last week that that they were unhappy with the proposed prison sentences, which they felt were too short. Almena had agreed to a nine-year prison sentence and Harris agreed to a six-year term in exchange for both men pleading no contest to all charges. Almena rented the Oakland, California warehouse and illegally converted it into an underground live-work space for area artists and an entertainment venue called the Ghost Ship. Almena hired Harris to help manage the facility by collecting rent, booking concerts among other duties. They are the only people facing criminal charges for the deadliest structure fire since 100 people died in a Rhode Island nightclub fire. Cramer said he believed Harris was truly remorseful and that the "deal is fair." But since the plea bargain was a package deal, he had no choice but to reject Harris' proposed sentence as well. Harris' attorney, Tyler Smith, said he is hopeful that Cramer will ultimately decide to sentence Harris to six years in prison despite the new objections raised by O'Malley, the district attorney, in her the letter to the judge.